Tongue is a sensitive organ of the oral cavity that is responsible for many vital functions like taste, swallowing, speech, mastication, speaking and breathing. Geographic tongue is a frequently encountered oral condition with a controversial etiology. Since it is an asymptomatic condition known to resolve completely on its own, it is usually discovered during routine clinical examinations. Furthermore, it warrants treatment only when it becomes symptomatic. It can be present on any surface of the tongue but the commonest site is dorsal surface, where it characteristically presents with a migratory pattern that changes in location. This case report describes the uncommon occurrence of the tongue lesion diagnosed in children which is seldom reported in the pediatric literature. Here, the authors present three cases of geographic tongue in young children which is rarely reported. A 5-year-old [Figure 1] female patient with chief complaint of decayed upper front teeth, reported to the department of oral medicine and radiology. Medical history, family history and general physical examination were non contributory. On clinical examination, maxillary central and laterals were carious. Filiform papillae were absent but an irregularly erythematous patch with a red and white lesion surrounded by white circinate borders was present on the entire dorsal surface of tongue [Figure 2]. According to the patient's mother, it was present from last 1month but not associated with any discomfort. On routine investigation, hemoglobin was found to be 12.5 gm% and total RBC was 2.8 ml/mm 3 . A smear was done to rule out candidal superimposition after a written consent was obtained from the patient's mother. Diagnosis of caries in relation to 51,52,61,62 and geographic tongue was made. Patient was advised to go for extraction of anterior teeth after radiographic evaluation and reassurance for the tongue lesion. Patient was recalled for regular follow-up. A 5-year-old boy came with a chief complaint of dirty looking teeth since 2-3 months to the department of Oral Medicine and Radiology. Intraoral examination showed good oral hygiene. There was an irregularly erythematous, asymptomatic lesion extending from the tip of tongue to the right lateral border of tongue surrounded by an elevated thick white border [Figure 3]. Filiform papillae were absent. After obtaining an informed consent from the patient's parent, a smear was made which came out to be negative for candidal infection. Blood investigations were within normal limits and no known allergen was reported by the parents. As there were no predisposing factors evident, only counseling the parents for proper oral hygiene maintenance especially of the tongue was recommended. 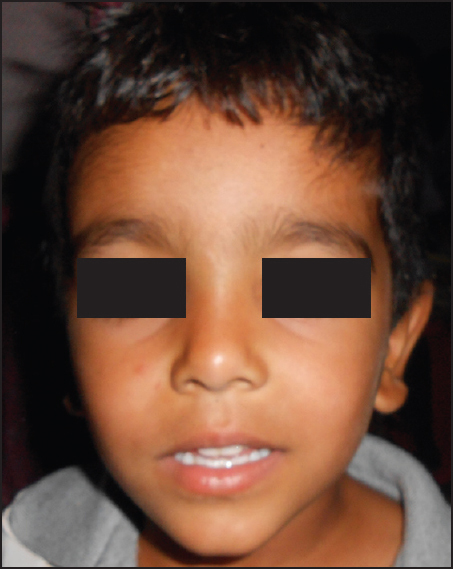 At 15 day follow-up visit the lesion showed drastic healing [Figure 4]. 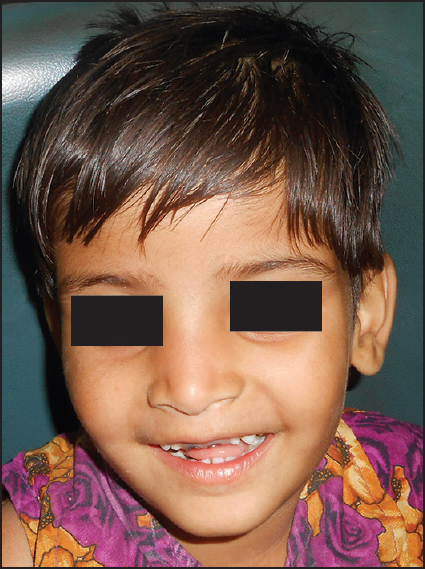 A 4-year-old boy [Figure 5] reported to our OPD with a chief complaint of dirty looking teeth since 1 month. On intraoral examination, the dorsum of tongue showed large denuded areas representing atrophy of papillae [Figure 6] with no white circinate borders surrounding the lesion. Smear was negative for fungal infection. A provisional diagnosis of geographic tongue was made. In this case also since no etiological factor was evident, only oral hygiene instructions were recommended for the follow-up visits. None of the above presented cases had any relevant systemic and/or family history and their general physical examination was not contributory either. There were no associated skin lesions in these patients. No positive history of any drug intake or allergy was documented. And in all the subjects there were no symptoms associated with the lesion. Smear was done to rule out candidal superimposition. The patients and their parents were instructed for proper oral hygiene maintenance. Also reassured for the tongue lesion which is self healing and observed for any reoccurrence. Only the second patient reported with remarkable response. The other two patients follow-up was not possible as their contacts were lost. Geographic tongue is a condition represented as areas of multifocal, circinate, irregular erythematous patches bounded by a slightly elevated, white or cream-colored keratotic band or line. The central erythematous patch represents atrophy of the filiform papillae. The white border is composed of regenerating filiform papillae and a mixture of keratin. These patches are of various sizes and shapes. Some consider the condition to be a congenital anomaly and others believe it to represent an acute inflammatory reaction. Females are more commonly affected unlike in this case series, where two were males and one was a female child patient. The etiology of geographic tongue is unknown till date and the literature reports varied predisposing factors. So far there is no difference (clinical or symptom related) reported between geographic tongue in children and adult patient. Careful examination and investigations are recommended to rule out probable etiological factor. Reassurance and follow-up of both young and adult patients is mandatory, so that unnecessary treatment protocol is not undertaken. Also long-term follow-up studies should be initiated to know the course, duration of the disease and probable outcome of different treatment modalities in future. Goswami A, Verma A, Verma M. Benign migatory glossitis with fissured tongue. J Indian Soc Pedod Prev Dent 2012;30:173-5. Sigal MJ, Mock D. Symptomatic benign migratory glossitis: Report of two cases and literature review. Pediatr Dent 1992;14:392-6. Shobha BV, Barkha N. Benign migratory glossitis: Report of two cases. Indian J Dent Adv 2011;3:708-10. Jainkittivong A, Langlais RP. Geographic tongue: Clinical characteristics of 188 cases. J Contemp Dent Pract 2005;6:123-35. Redman RS. Prevalance of geographic tongue, fissured tongue, median rhomboid glossitis and hairy tongue among 3611 Minnesota school children. Oral Surg Oral Med Oral Pathol 1970;30:390-5. Meskin LH, Redman RS, Gorlin RJ. Incidence of geographic tongue among 3668 school children at university of Minnesota. J Dent Res 1963;42:895. Tago T. Clinical study on geographic tongue. Kurmure Med J 1961;24:1156-72. Marks R, Czarny D. Geographic tongue: Sensitivity to the environment. Oral Surg Oral Med Oral Pathol 1984;58:156-9. Redman RS, Vance FL, Gorlin RJ, Peagler FD, Meskin LH. Psychological component in the etiology of geographic tongue. J Dent Res 1966;45:1403-8. Marks R, Taitt B. HLA antigens in geographic tongue. Tissue Antigens 1980;15:60-2. Rhyne TR, Smith SW, Minier AL. Multiple, annular, erythematous lesions of the oral mucosa. J Am Dent Assoc 1988;116:217-8.
van der Wal N, van der Kwast WA, van dijk E, van der Waal I. Geographic stomatitis and psoriasis. Int J Oral Maxillofac Surg 1988;17:106-9. Raghoebar GM, de Bont LG, Schoots CJ. Erythema migrans of the oral mucosa. Report of two cases. Quintessence Int 1988;19:809-11. Jainkittuyang A, Langlais RP. Geographic tongue: Clinical characterstics of 188 cases. Am J Med 2002;113:751-5. Menni S, Boccardi D, Crosti C. Painful geographic tongue in children (benign migratory glossitis) in a child. J Eur Acad Dermatol Venerol 2004;18:737-8.